This oil painting, by Miss Lucille Richards, hangs in the South Spencer Middle School library. It is dated December 19, 1972 and depicts the Jones Store in the Village. Miss Richards was an English, speech, and dramatics teacher at Rockport High School. Lincoln Pioneer Village is an unusual example, unique in Indiana, of an educational tourist attraction base on local history that was built under the auspices of two New Deal programs, the Federal Emergency Relief Administration (FERA) and the Works Progress Administration (WPA). As such, it embodies the ideal so prevalent in the 1930's of the intelligent use of leisure time. 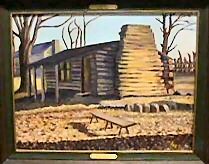 A particularly ambitious project for such a small town, Lincoln Pioneer Village was designed by noted artist and sculptor George Honig, best know for his heroic works Spirit of 1861 and Spirit of 1916 in Evansville. He also had numerous small bronze memorial sculptures throughout southwestern Indiana. Honig supervised the construction, although not all the elements present in his early sketches were realized. In 1926 the city of Rockport purchased the former Spencer County Fair Grounds, long abandoned, for a new park. The town already had one park, Rockyside (alternatively spelled Rocky Side), a narrow strip of land below the bluffs along the Ohio River and the site of the historic boat landing from which Abraham Lincoln had embarked on his fabled trip to New Orleans. The Lincoln Pioneer Village was primarily the brainchild of sculptor George Honig, a native of Rockport and a well-known student of Lincolniana, who approached the Spencer County Historical Society with his idea in 1933. The society, which had formed in 1915 to prepare for Indiana's centennial celebration the following year, enthusiastically supported the plan. Incorporated in 1928, the organization's mission was largely to promote the Lincoln legacy as well as the general history of the area. They regularly presented a pageant on Lincoln's flatboat trip from Rockport to New Orleans every two years at Rockyside Park, but the proposed Lincoln Pioneer Village would be something new and permanent. Honig and a society representative approached the Civil Works Administration (CWA) in early 1934 but nothing came of it. The project seems much too grand to have been accepted by the CWA in any case, since that agency was only meant to be temporary, to help provide jobs that would tide unemployed workers over the winter. CWA was discontinued at the end of March 1934, but the Federal Emergency Relief Administration (FERA) began a program of work projects soon after. Honig, with the full support of the historical society, took his plans to the city council, which successfully applied to FERA for funding to erect the memorial village that would make our town a center for tourists. FERA would provide funds for the labor, but nearly everything else was the local sponsors' responsibility. An intensive public campaign to solicit money, materials, and artifacts from the community, the county, and even statewide was very successful. Descendants of the pioneers whose homes were replicated in the village even donated family heirlooms to furnish the buildings. With much ceremony and festive celebration, the Lincoln Pioneer Village was dedicated July 4, 1935. Scores of costumed interpreters portrayed specific characters and generic pioneer Hoosiers. Ten log buildings had been constructed by FERA workers, along with various elements of landscaping: wells, fencing, and replica pieces, such as an ox cart, standing about to add to the pioneer atmosphere. While placed in a setting to represent a typical early nineteenth century village in Southern Indiana, each building replicated one that had actually existed in Rockport or at various sites throughout the county. With the introduction of the WPA the same year, a new project was applied for immediately that would add more buildings to the village, as well as substantial landscaping and recreational facilities to the park. This work was completed in 1936 and dedicated, again with much fanfare, on July 4, 1936. Lincoln Pioneer Village was vigorously promoted by Rockport and the Spencer County Historical Society (especially through the prolific writings of its president, Bess V. Ehrmann) as a memorial unlike any other ever built to honor Lincoln, as well as a worthwhile attraction depicting a type of pioneer village in Spencer County between 1807 and 1830. But most of the individual structures were replicas of actual buildings, as close to the originals in appearance and construction as could be ascertained, that had been scattered throughout Spencer County; many played some role, large or small, in Lincoln's coming of age here. Information taken from National Register of Historic Places Continuation Sheet, Narrative Statement of Significance.